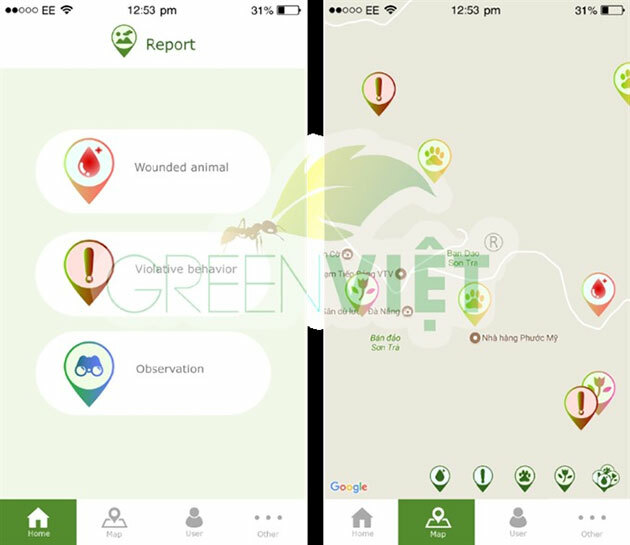 The Biodiversity Conservation Centre of GreenViet, an NGO in Da Nang, will launch a warning application for smart phone users to alert of violations against animals and vegetation in the Son Tra Nature Reserve. Director of GreenViet, Tran Huu Vy, told Viet Nam News the Son Tra SOS application will be used from November. Smart phone users can report or send photos of illegal logging or hunting in the reserve to GreenViet for rapid response. Vy said the Son Tra SOS, funded by the International Union for the Conservation of Nature (IUCN), would create quick supervision of any dangerous situations and infringements in the reserve, which is just 10km from the city centre. GreenViet has been developing a website for the red-shanked douc langurs (Pygathrix nemaeus) – an endangered primate species. The NGO is also co-operating with the Frankfurt Zoological Society of Germany, San Diego Zoo Global in the United States and the IUCN to protect the red-shanked douc langurs through long-term campaigns. More than 440 visitors had joined free biodiversity trips in the reserve, while 400 junior secondary school students were taught about biodiversity in the reserve. According to a recent report by the city’s rangers, six monkeys were killed by motorcyclists in 2015-17, and two cases of illegal hunting were uncovered. Two red-shanked douc langurs were also killed for money. Around 10ha of forest was illegally logged for buildings in three cases between 2014-16. The langurs in Son Tra Nature Reserve were declared endangered by the International Union for the Conservation of Nature (IUCN) in 2013, but the species has recently been classed Critically Endangered (CR) – nearly extinct. Biologists warn that the development of concrete buildings will push the endangered primates into extinction. In March, the National Administration of Tourism designated Son Tra Mountain a national tourism site. It will host a luxury eco-tour resort complex including 1,600 luxury hotel rooms, and 4.6 million tourists by 2030. The nature reserve has shrunk from 4,300ha in 1977 to 2,500ha in 2014 to make room for the development of dozens of resorts and hotel projects. More than 20 streams in the reserve have dried up./.